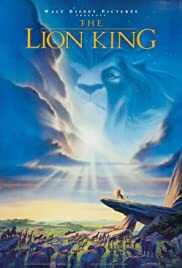 A young lion prince is cast out of his pride by his cruel uncle, who claims he killed his father. While the uncle rules with an iron paw, the prince grows up beyond the Savannah, living by a philosophy: No worries for the rest of your days. But when his past comes to haunt him, the young prince must decide his fate: Will he remain an outcast or face his demons and become what he needs to be? I find it hard to believe that kid's movies these days will ever be called classics in years to come (excluding Pixar movies). In my mind, this is the last classic hand drawn film, and it upsets me that I have to wait for another five years for it to come out on DVD. This film deals with great issues and involves a huge conflict for the main character, something that recent kid/family films lack. It is funny and lighthearted when it should be, and heartfelt and serious when it needs it. I believe that everybody should see this movie, regardless of your age. It may just be the last good movie that Disney will ever do without the help of Pixar.